I live and work on the Gold Coast, Queensland, Australia. Having had a lifelong passion for wood I have developed the various skills necessary to work it. Mostly self-taught, in addition to traditional cabinet making techniques I also use turning and carving as required by the design. My influences include James Krenov, who had a major influence on my woodwork through his book, "The fine art of cabinet-making". Shaker furniture has always appealed to me because of its honest simplicity. Where appropriate I like to incorporate "Oriental Accents" into my designs, which I believe imparts a lyric quality. 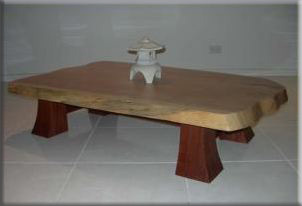 The flare in the legs of the coffee table pictured to the right is an example of this. On this site you will see photographs of various pieces. These are indicative of the work I do, but should not be considered an exhaustive list. I will consider any piece made of wood! By Denis Murray.